You may have heard about the Pareto Principle, or the 80-20 rule, before. It holds that 20% of causes result in 80% of outputs, 20% of the work causes 80% of the results, 20% of the clients yield 80% of the profit, and so on. The percentages aren’t exact, of course, but the basic premise (that a small percentage of what we do yields most of the results) is an incredibly useful analytical tool for your business. If you want to learn how to apply the 80-20 rule to client liaison, your choice of clients, your prices and the work you do, this article will explain how to do that. 80-20 freelancing could allow you to do less work while making the same amount of money. If you’re lucky (and savvy), you could end up increasing the profitability of your business by doing less and focusing only on what’s important. 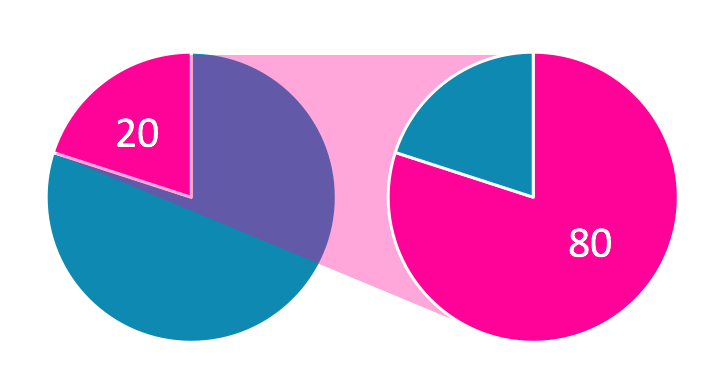 Can you find the Pareto Principle in your client base? Let’s say you have three recurring clients each week (the 20%) who pay well. You need to do very little to maintain the relationship: send your work when it’s finished, and that’s it. These three recurring clients are probably worth 80% of your profits. Consider the other 80% — the one-off clients who email you back and forth negotiating payment, laying out the terms of work, asking you to revise, and so on. Once you finish the job, they’re finished with you. In this situation, the 80-20 thing to do would be to divert the energy you spend on searching for one-off clients into searching for another weekly, recurring client. Once you’ve done the initial negotiation work you’ll have cut down to 20% of your client base while keeping your profits at 100% of their previous rate. The way you apply 80-20 to clients will, of course, be different, but the spirit remains the same. 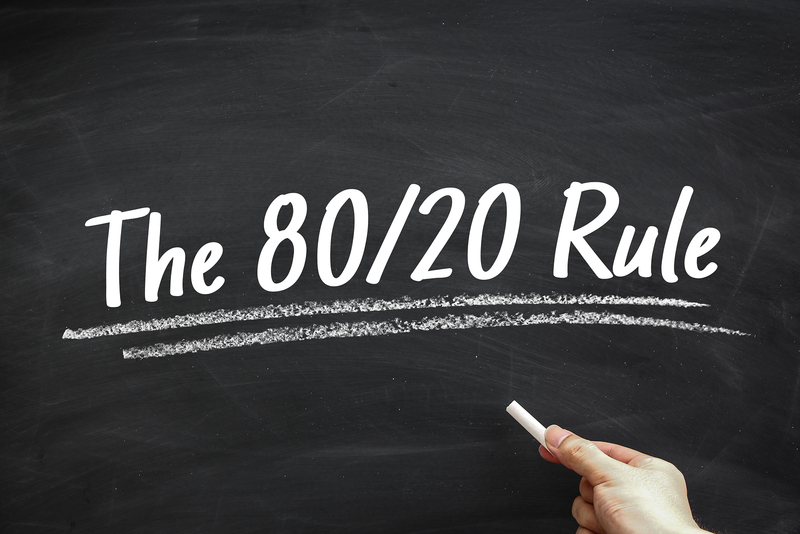 Sit down and analyze how you could benefit from applying the 80-20 rule to the clients you take on. What if you stopped searching for one-off, mediocre jobs and focused all your efforts on finding that one, high-paying client? The idea here is that 20% of correspondence causes 80% of the results. If you begin to notice a regular pattern to negotiations, short-circuit the process by providing a FAQ to all prospective clients. I.e. How much do you charge for different types of work? How do I pay you? How can I contact you? and so on. 1st email from client: I’m thinking of hiring you for such and such. How much do you charge? Response: I’d charge $100 for that. 2nd email from client: Would you do it for $80? 3rd email from client: Mmm… OK. How do I pay you? Response: Here’s my PayPal address. 4th email from client: Alright, I’ve paid you. Let’s start. OR, you can skip that part. When a client sends an expression of interest and the job they’ve described is something you’re interested in doing, you can attach a FAQ to your response rather than emailing back and forth a hundred times. A good FAQ could significantly reduce the time you spend on liaison. Another strategy you can use to cut down liaison time is to post your rates wherever you advertise your availability. This will block off expressions of interest from anyone you wouldn’t seriously consider working for. If you’re like me, 50% of your liaison with prospects will end in “That’s more than I’m willing to pay.” If you’re upfront about your rates you’ll filter out mutually disappointing exchanges. The principle as it applies to the work day looks something like this: 20% of the work earns 80% of the money. As a freelance blogger, my 80-20 breakdown (pre-Pareto) looks like this. What’s yours? 80 = answering email, reading feeds, thinking up post ideas, writing up to-do lists, checking up on my freelance posts, tracking finances and sending invoices. 20 = writing and finishing articles. If you’re trying to Pareto your work day, the question becomes: what part of the 80 can I eliminate without losing profits, or at least, without losing more profits than I’d gain by re-directing my time into a task in the ’20’ category? If you doubled your rates, but your prospects dropped by 40%, you’d still be making more money than you were before. Less clients to manage also means more time. The essence of the 80-20 rule is this: focus on what’s important and eliminate or minimize what isn’t. It’s a simple guiding principle with the potential to super-charge your freelancing business.